This chain conveyor is exceedingly rugged and simple. P+F conveyors are used primarily where processing operations do not correspond to the conveyor material flow. Features: A constantly moving power chain which is coupled to the chassis frame with the aid of a catch. The distance between the vehicle bodies is defined by the adjustable distance between the catches. 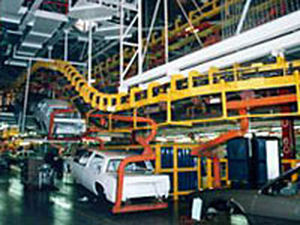 The catch release allows the chassis frame to be stopped if necessary despite the fact that the chain is still running.